As part of the band led by talented guitarist Eveline van Kampen is hailing from Hoorn, Illumion seemed a logical choice for Knight Area as support act. 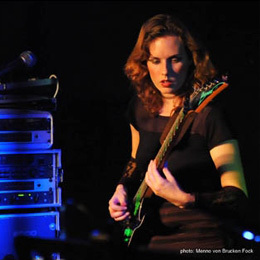 Illumion is Eveline van Kampen (guitar, composer), Peter H. Boer (bass, stick, E-bow, producer), Esther Ladiges (vocals, flute), Gerton Leijdekker (keyboards, 'MIDI-guitar') and Tom Rutgers (drums). Illumion opened with Metamorphosis, a nice melodic song with a modest role for the keyboards and groovy bass playing by Boer. Though in a different order, the band played the debut album Hunting For Significance in its entirety. Differences with the studio versions, as could be expected, were evident: no multi layered background vocals by Esther, just one guitar instead of two and sometimes even more and Gerton Leijdekker playing 'keyboard' through his guitar using MIDI. Ladiges had to sing more powerful than on the album and because she did, the songs got a more 'rock' feel rather than 'jazz'. No point in mentioning I thoroughly enjoyed that! Leijdekker obviously liked playing the 'guitar' much more than the keys (The Bliss!) and because of the peculiar sound combined with a different stage performance, I would say: keep it this way! Also some nice duels between Eveline and Gerton are not only adding to the live performance but they result in a different arrangement which is always a good thing in a live show. Esther playing the flute (I think it was Chrysanthemum) was also a nice 'bonus'. As the band did not play live too often until now and newcomer Tom Rutgers played his first gig with Illumion this night, it was not a surprise the musicians had to concentrate on their instruments more than the focus being to interact with the audience. Only Ladiges and Boer, both singing/playing in several other bands, were capable of performing more loosely. The overall quality of the sounds was quite good although I did not hear the bass pedals nor the bass as well as on the album. Though the band has to work on background vocals a bit more and avoiding a too static performance, musically this was an outstanding accomplishment by a group of talented musicians and I would like to pay a big compliment for Rutgers because in my opinion the drum parts on Hunting For Significance are not that easy to play, but Tom did a remarkable job there!